If there is an award for the kind of pet that is most difficult to figure out, no doubt, the award goes to cats. They probably have a love-hate relationship with their masters. They will tear down your stuff, leave scratches on your couch but most importantly, leave a footprint in your heart by their warm head bumps. If your cat is celebrating its birthday today, a unique birthday wish may be a good idea along with food and treats. Here are some greetings to give you inspirations on how to win your pet cat’s attention today on its special day. 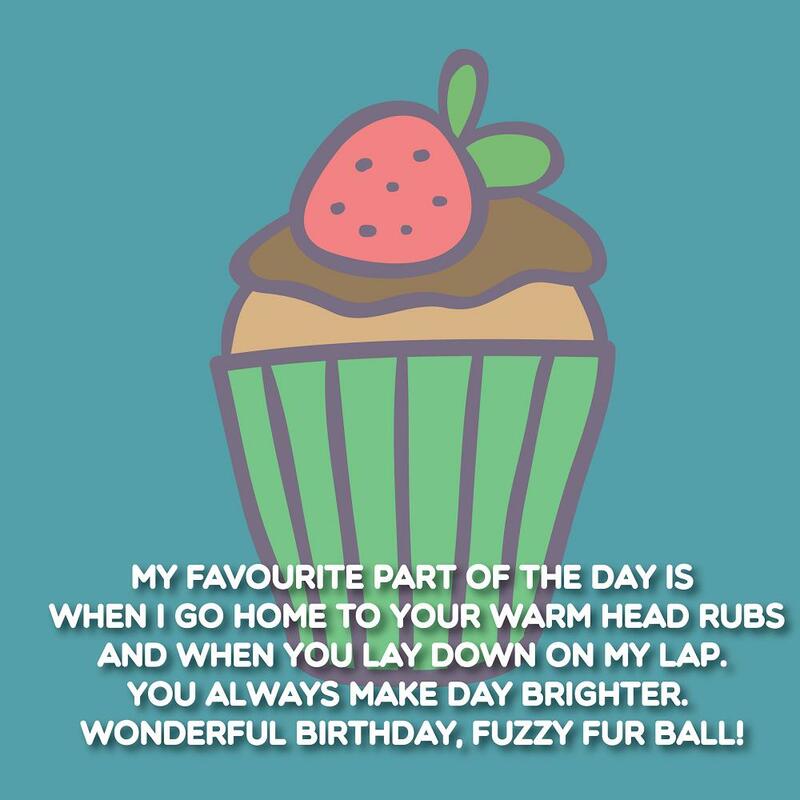 To my lovely fur ball, happy birthday to you! If you only know how cute you are – those subtle head bumps, every purr when I try to rub your back, and those fierce blue eyes whenever you need some love. I just can’t get enough of you! To the lucky charm of my life, my one sweet fur ball, happiest birthday to you! Oh how I envy a life like yours – eat, sleep, play around, and purr! The warmth of your fur and every wave of your tail remove all my worries and stress away. When you say meow, I know that you mean I love you, and for that, I love you too! Happy birthday to my adorable cat! I always look forward going home after a long day of work because of you, my charming little fur ball. Knowing that I will get the sweetest head rubs excite me even more. 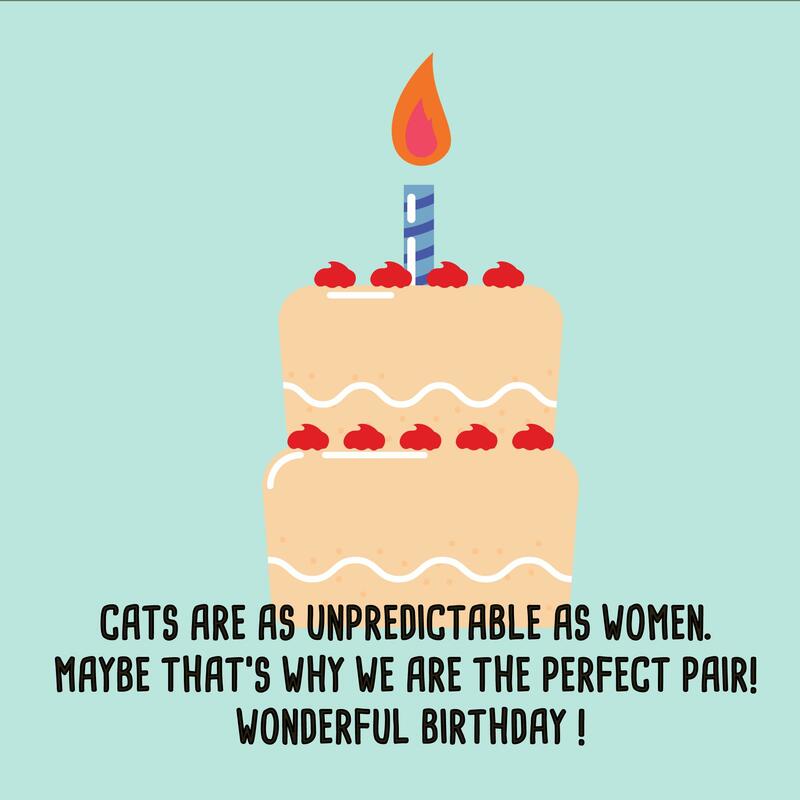 May you have a purry birthday! People say having a pet is like having your own child – it is a big responsibility. I was prepared for scratches, never ending mess, and additional food expenses. Well, you are quite a troublemaker but you are the most adorable one. Thank you for always making me happy. Best birthday to you my sweet fur ball! They say cats like you have multiple lives, 9 to be exact. I know that’s a lot but it’s never enough for us to spend more time together. On your birthday, I wish for 99 more and even 99 years to spend with each other. Happy birthday! When I first met you, I told myself it’s going to be fun having a cute little pet like you. But I got it all wrong, you run the house like a real boss, still cute though. Happy birthday to my bossy fur ball! To the cutest nagger of all, my lovely fur ball with an attitude, happy birthday to you! Even if you are bossy most of the times, you never fail to melt my heart with your head bumps, your body rubs, and your slightly annoying but cute meows. You are definitely the little master of this house. My life before you was boring – no head bumps, no hairballs to pick up, no warm and fluffy fur to touch, no mess to clean up, no back scratch, and no leg wraps. You definitely made it happier with every purr that you make. I know that you love me even if you’re demanding things most of the times. Happy birthday, little boss. I love you! Did you know that my boyfriend envies you a lot? It is because you receive more of my attention most of the time. He knows that I want to cuddle you at bedtime, scratch your back, and give you the warmest rubs. Have a wonderful birthday my adorable cat! I do not know how you can manage to be so cute all the time even if you are doing things that are usually annoying like destroying stuff and coiling around my feet. All I’m sure is, you make me happy. May you have the best birthday, my dazzling little fur ball. Whenever I’m having a tough time, I just imagine your big round eyes, your fluffy fur, your cute little paws, and the way you purr. To the most amazing kitty cat in this planet, happy birthday, love! I thought cats should be bossy and fierce all the time, but you my love is the sweetest of all. God must have granted you all the sweetness in the world. Happy birthday, little one! You may have a weird way of showing your affection to me like scratching my furniture, taking over my bed, and screaming meows at my neighbors. I want you to know that I still love you despite of everything. Happy birthday to my cute bossy cat! Of all the things that you have intruded – my sofa, my room, my kitchen top, and my lap, my favorite is how you have stolen my heart. Happy birthday, kitty cat! To my little temperamental piece of fur ball, happy birthday to you! We are definitely a team for having the same fickle attitude! I love you! I don’t mind giving up the title of being the most adorable family member. You are indeed the cutest. Happy birthday, fur ball! I love my best buddy more than anyone else in this world. Her amber round eyes are fierce and can get whatever it is that she desires, her moves are classic and elegant, her ways are just simply irresistible. She is not a diva, she is my adorable little kitty. Happy birthday, my darling! You have a very special space in my heart that no human can ever fill. You make me extremely happy and stress-free. 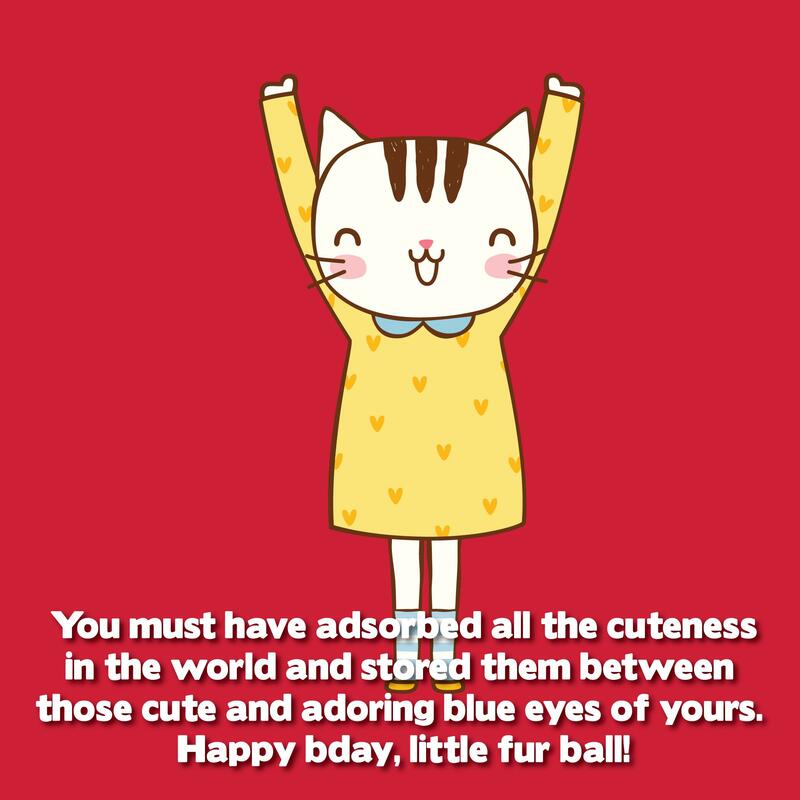 Have a wonderful birthday, my dearest fur ball! Your arrival in my life brought me a lot of new things that I have no idea of before. I did not have any clue on how to take care of someone else other than myself, nor how to clean the house, and how much cat food there is on earth. You opened my world into a whole different one. It is definitely messier, but it is a lot happier too! I am thankful that you came into my life. Happy birthday, cutest fur ball! You are my inspiration to be as carefree as possible. I want to be like you and not think about anything else other than to relax and chill. Best birthday to you, pretty kitty cat! I am now officially declaring that you are more of a master to me than a pet. Well, I really do not mind as long as you will not stop coiling around my legs and staring at me with those cute bright eyes. To my cute little furred boss, happiest birthday to you! To my furry baby, I love you and happy birthday! I am at my happiest every time I pet you. Your soft fluffy hair makes me want to squeeze you, you shoo my stress away. I wish you’ll not stop those head bumps for I like them so much! It doesn’t matter how many scratches I now have on my coffee table, or how my sofa is filled with your hairballs, as long as you’ll keep on showering me with love and sweetness by rubbing your head upon my legs. Happy birthday to my cute cat! Cats do not have much tricks than dogs do, but you, my lovely kitty only need one trick to amaze everyone. That is to stare with your big, green, and captivating round eyes. A fantastic birthday to you, my fluffy angel! You surely have a strange way of showing your affection for me and even a weirder way to ask for my attention. How can someone who lightly scratch my lap, tear the pages of my books, and intentionally sit on my keyboard when I am on it be so cute and sweet? 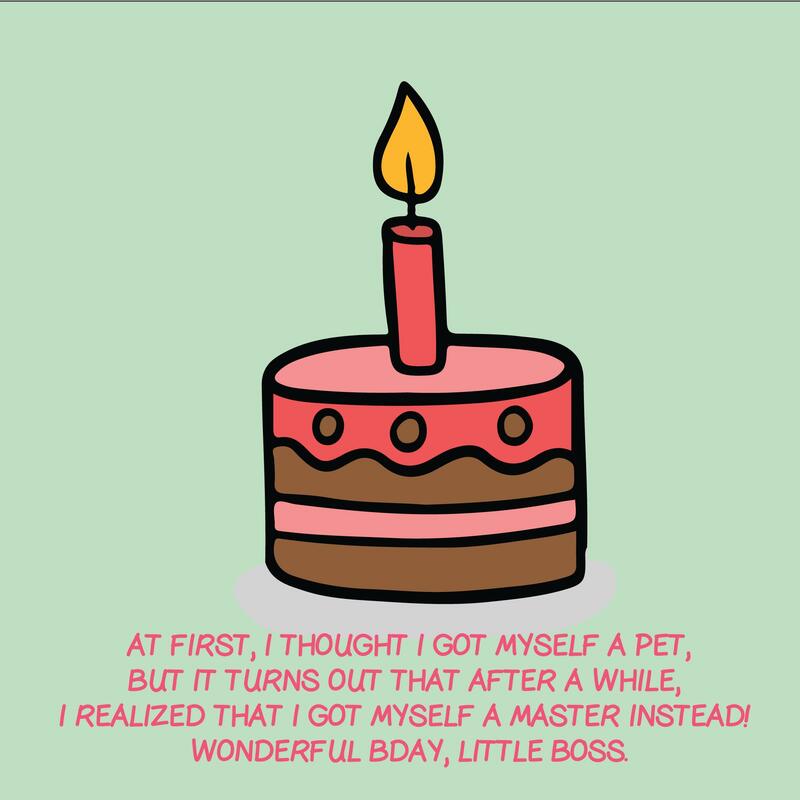 You have really mastered the art of bossing around. Happy birthday to my cute little kitty! Every purr and every meow from you is like a sound from heaven. Whenever I hear it, my heart jumps with happiness for having the best pet in the world. You proved to me that it is the right choice to have a cutie cat like you. Happy birthday! People say cat ladies are weird people, I do not mind being called one if the consequence is having you in my life for a really long time. To my adorable little tiger, happy birthday! Little tiger, today is your lucky day. I am going to spoil you with treats until you can’t take it anymore. It’s going to rain cat food in the house too! On your birthday, I wish that you’ll stay cute forever. Happy birthday, kitty! Cats are truly demanding and mysterious. You will not really know if they are coiling on you because they are hungry, or because they just simply wanted your attention. But whatever your reason may be for always rubbing your head on me, I do not mind it for you are the cutest. Happy purry birthday, fur ball! I can’t decide on which one you look the cutest – sleeping, munching on your cat food, biting your tail, or playing with your toy. You look equally adorable! Best birthday, fur ball! You made me realize one important lesson in life – when everything gets crazy, all I have to do is to chill and let life flow as it is. You are the coolest cat I know. Happiest birthday, kitty! Dearest little tiger, today is your day to take command in this house. On your birthday, we will play with your favorite teaser – your feather charmer! You will also have the privilege to eat as much munchies as you want. Best birthday, darling! When you wandered around for a few days, I couldn’t sleep the same. I always wake up at night looking for my cute little fur ball. The house looks empty without you as well and the quietness without your meows are like torture to my ears. Please do not leave me again! Happy birthday to my adventurous kitty! To the sassiest cat that walked and meow on this world, a wonderful birthday to you! You possess the brightest green eyes and the softest fur! You are truly the most adorable cat I’ve seen! I may be bigger and older than you, but you boss me around like a true master! The scratches on my legs and the trouble of cleaning up your litter are just some of the proof. Your love on the other hand though is something that is worth all the mess. Happy birthday, little tiger! Dearest little buddy, do you know what’s better than night-outs with my friends at the club? That is, staying in on weekends with you and watching a couple of Netflix movies together. There is nothing that can be compared to the comfort of your fluffy fur! You are no doubt the best cat in the world. Happy birthday! Every time you start to lie down and stare at me with those big amber eyes, I can’t help myself but to rub your belly. I know you don’t like it that much and I may get a few scratches here and there in return, but you are so irresistibly cute! 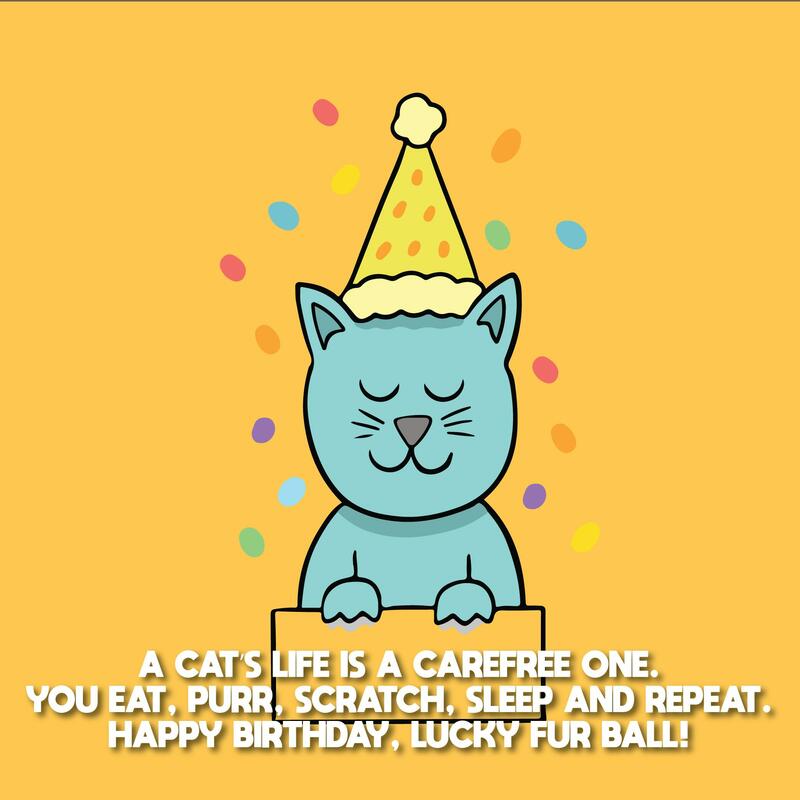 May you have the best birthday, fur ball! You are the perfect partner for me. You do not ask for attention all day, you do not need to be walked around, you are fine with me not teaching you tricks, and most importantly, you have the biggest and bluest eyes I have ever seen! You are just the best kitty in this world! Happy birthday! If everyone who nags and boss around is as cute as you, then I don’t mind being bothered. You are a one big snob yet you stole my heart. To my sweet tiny boss, happiest birthday to you! You make my rainy days complete with you curling up on me and gently scratching me with your cute little paws. You along with my book and my hot cocoa are all I need on a cold gloomy day. Happy birthday, sweetest cat! There is only one that I admire in this world the most, and no, it’s not another human being, it is you my lovely cat! You inspire me with your sassy and careless attitude! I learned that nothing can bother my inner peace if I don’t pay attention to them. Happy birthday to you my dearest little tiger! To my cuddly kitty who has dominated over my bed, couch, pillows, laptop, and my heart, happy birthday to you! You are definitely the cutest cat ever! I wanted to post your videos on Youtube so I can share to the whole world how cute of a pet you are. On a second thought, I want you all to myself too! Happy birthday, little boss! Do not scratch me for not buying you a present on your birthday, it is not my fault that you’re sleeping on my wallet the whole time! I’ll greet you a happy birthday instead. I love you, kitty! I have a feeling that you’ll enjoy opening my gift for you more by scratching all the wrappers out instead of the gift itself. Whatever it is, I hope you’re happy today, master. Happy birthday! People said women are scary for having unpredictable attitude. If that is true, then you my cute little cat are the most spine-chilling of all. Your mood swings are just out of this world, but you are still the cutest and I love you. Happy birthday! To the most charming member of this family who never fails to captivate our eyes and hearts because of her cuteness – our lovely fur ball, happy birthday! Every purr you make melts my heart away and every meow just brings joy into my life. You are truly the hero of my life. Happy birthday my sweet little darling. I have the greatest best friend of all. She is beautiful, eye-catching, alluring, independent, and self-sufficient. No she’s not a diva nor a celebrity, she’s my adorable cute little kitty. Happy birthday, sweetheart! People say black cats are bad omen. I did not believe in them, because you, my black beautiful little kitty brought me the blessings of my life. Happy birthday, love! You truly have the best understanding of how attractive your big eyes are and how adorable your personality is. You are even using it for your own advantage bossing me around asking for food and cuddles. Happy birthday, my cute little master! Sometimes my boyfriend wants to turn into a cat because of the special treatment you are getting from me. Curling up with me during bedtime, constantly caressing your soft fur, and even your simple head rubs are just some of the things he is envious about. Happy birthday, fur ball! You have already stolen my heart and yet you were not satisfied. You stole my couch and my bed too! I still love you though. Happy birthday to you! You are the true superstar of this house and I wish I can do the things that you do. There is no one else that I know who can sleep, play, eat, and goof around without minding anyone else’s business. Happy birthday, cat! I usually ask myself if I am really your master or if it is the other way around. I guess you boss me up more than I do. 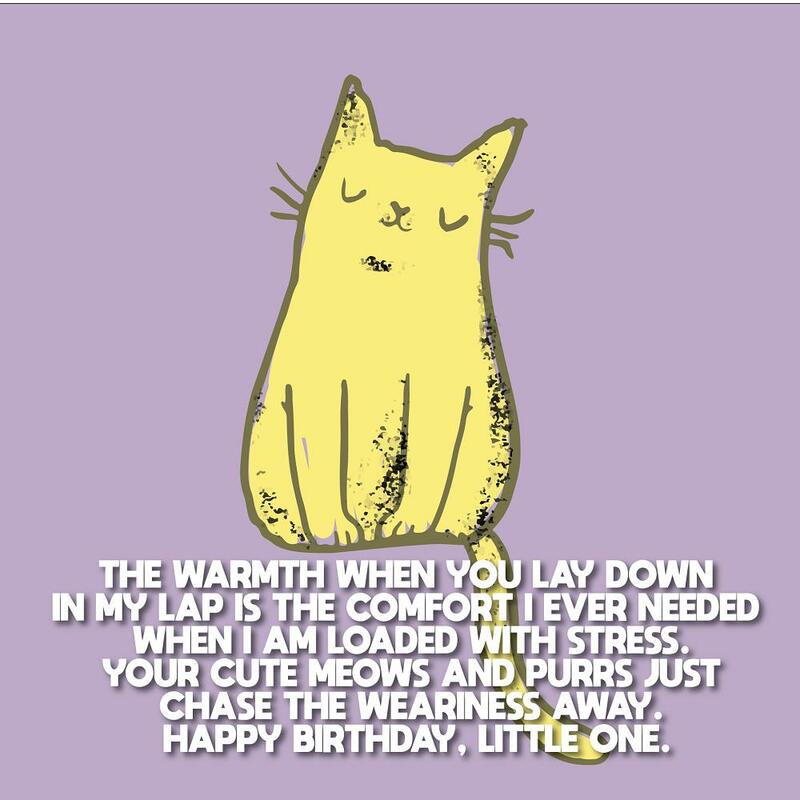 To my dearest kitty with a bit of attitude, happy birthday! You took the phrase age is just a number to a different level. You do not even care about how old you are as long as you always get treats and attention. Happy birthday to my independent and carefree cat! When you were a little kitten, you purred so sweetly that I had no choice but to adopt you. I’m glad I made that decision because you have grown up to be the most amazing cat of all. Happy birthday, sweetie! I think you have perfected the sorcery and the power of your cute little roar. Every time you meow at me, it feels like I am hypnotized to give you food and back rubs. Happy birthday to my witch cat! You have seen a couple of heart breaks I previously had. I cried in front of you like a baby but you didn’t judge me anyway, instead, you lend your soft fur on me so I can touch them and feel a relief. Happy birthday, baby! They say that cats like you have nine lives to live. Well I hope you spend those nine with me. You are lucky to have the brightest eyes and the cutest face, otherwise, I will be pissed by the scratches you left on my couch and books. Happy birthday, kitty! No one informed me at the pet shop that it is not a cat I am getting but a very demanding boss. Just thank your lucky stars for being so irresistibly cute. Happy birthday, lovely master! You make everyone in the house crazy when you are hungry and need food. You make everyone scoot when you want to lay down and nap. But every time we wanted a bit of your attention, you jump and run off really fast. Happy birthday to our one true master, our self-centered but cute kitty! For other people it may look like you are casting me aside, but I know that deep in your little kitty heart, you love me so dearly and I will forever bask in your cuteness. Happy birthday, love! You are even better than all the magicians combined, for no one can make me laugh so hard during the darkest times other than you. Happy birthday to you my little kitty sunshine. You are definitely what I call heaven on earth. Your angelic little face, your sweet meows, your soft white fur, and your cute purrs make everything in this world magical. To my dearest kitty, happy birthday! When I put a pet flap on every door in the house, I gave you the permission to visit every room. You never only entered each and every corner of the house, you also entered and stayed in our hearts. Happy birthday, fur ball! It is a glorious achievement for me to uncover the secrets to a happy and peaceful life. The answer is you, my little fur ball of sunshine, my cat. Happy birthday and I love you so much. Even the dog-loving people in this town are envious of me when they see that I have a cute little pet cat like you. Happy birthday! I do not consider you just a pet that I need to take care of and feed. You are my cure to life’s difficulties because every purr that you make gives me the calmness that I need. Happy birthday! To the most royal princess of all, my lovely kitty, happy birthday to you! I would gladly be your servant today so do not hesitate to meow whenever you need anything. If not for your cute purrs and meows, I would be totally annoyed by your self-centeredness. But you are so cute I couldn’t stop admiring you. Happy birthday! I cannot pin point the reason why I love you so much. You do not pay attention to me, you never bother to wake up when I come home, you scratch me when you get annoyed, and you demand food most of the time. Happy birthday, kitty! I am thinking of one word that would describe your big amber eyes, your pointy ear, your little nose, and your long tail. Then I heard of the word cute and I knew that’s it! Happy birthday, cutie! Happy birthday best bud! Know that I am jealous of the life you live – eat, sleep, and repeat! I know that you are dying to be called master. So today, on your birthday, your wish is my command. Happy birthday, boss! Your purr is like a fire that warms even on the coldest days. My heart is filled with delight every time you meow. Happy birthday to the most special cat in the world. I now understand why you are called a cat, it is short for Charming, Adorable, and Touchy. Happy birthday, kitty! I do not care how many times you scratch my sofa, destroy my cushions, lick my books, leave your hair balls on my bed, and purr none stop. I will still love you the same and each year it will grow even stronger. Happy birthday, lovely cat! You are one lucky fella for having nine lives and do nothing but to sleep, eat, purr, meow, and demand. Happy birthday to my fortunate cat! My heart is like a candle that melts away with every warmth of your meow. 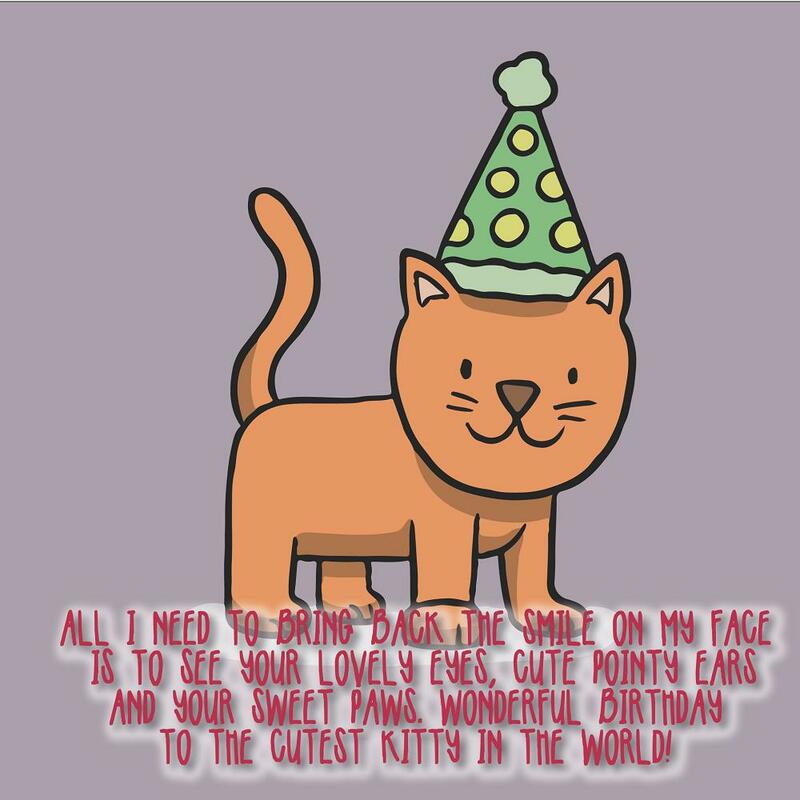 To the cat who owns the cutest purr of all, happy birthday to you! Do you know how fortunate you are? You do not have to work in order to have food, shelter, and a slave. You get it all by staring at me with your big eyes! I love you, cutie pie. Happy birthday, kitty! The only thing that is keeping me off to give you away is the attractiveness of your whole personality, so better be good to me! Happy birthday, fur ball. Being a cute cat and an effective balm for healing life’s troubles is not easy to do. That is why I adore you so much my intelligent little fur ball! Happy birthday! Some people are spending all their lives to find that one medicine to cure everything. I am lucky to have found my own, you! I love you kitty! Happy birthday! That small face that you have, your sweet long meows, and every move of your head when I give you rubs gives me a dose of heaven here on earth. Dearest cat, happy birthday to you! There is no doubt you have the haughtiest attitude of all the cats in the world. But I want you to know that no matter how prima donna you would become, I am still going to love you eternally. Happy birthday, fur ball! Dearest master, I never thought that you would be the strictest boss ever. I was expecting a sweet pet that would play with me every time I come home. Nevertheless, I love you so much and I’m wishing you a very happy birthday! On your birthday, my only wish is for you not to get tired of spending your nine lives with me. Happy birthday, kitty! Are you a magician, a shaman, or a witch? Every meow you make summons me. It is like I am under your spell and I cannot resist a single request from you. Happy birthday, smart cat! Even though you do not give importance if you are 2 or 12 years old, I still would like to greet you a very happy birthday. Today is your special day, so I am keeping your food canister full and your litter box clean. Love you, fur ball! My idol is not any other human being. She is an independent, strong, and adorable little kitty. No one can do the things that you do – carefree and happy all the time. Happy birthday to my amazing cat! My boyfriend once told me that his wildest dream is to become a cat like you. When I asked him why, he said it is because you are getting more favors than him like staying in bed with me all day and petting you all the time. Happy birthday, cutie! I know that you do not care about those people who are saying that you are a bad luck. In case you do, I want you to know that black cats like you are the best luck I have ever received. Happy birthday, gorgeous! You are way better than any other guys I have met. Your soft fur makes me calm, your sweet meow melts my heart, and your blue eyes give me chills. To my best friend, my lovely cat, happy birthday. You always ignore me especially when I wanted to pet you. You put your scratch marks all over my legs and furniture when I want to snuggle you. You only pay attention to me when I’m filling up your food bowl, but regardless of everything, I still love you so much! Maybe it is because you are too adorable not to give affection to. Happy birthday, my lovely cat! Today is the day I’m allowing you to wildly scratch this thing open – my gift for you. It is your birthday and I hope you’ll have a good one kitty. Have the most wonderful birthday! You might be famous in the cat world because you are simply amazing and beautiful. Your fur’s perfect! Happy birthday, fur ball! How can someone so self-righteous as you be so adorable and cute at the same time. You have the most remarkable meow and hypnotizing eyes. Happy birthday, cutie kitty. You have stolen everything in this house. From my couch, my bed, the kitchen floor, every rug, up to our hearts. Happy birthday to our favorite cat in the world. Dearest kitty, please do not put your scratch marks on me because I do not have a gift for your birthday today. After all, you were on my purse since yesterday. Happy birthday to my boss cat. When husbands say that having a wife is a headache because of their constant mood swings, I always roll my eyes and say try having a pet cat! But don’t worry kitty, I still love you more than anything else in this world. Happy birthday! To the most charming member of this whole town, happy birthday to you. I am proud to be your servant, my cute little kitty! If you are a human being, I am sure you’ll do well in Hollywood. You are stunning, cute, confident, charming, and independent. Thank God you are my pet, I get to enjoy being around you even if you are not famous yet. Happy birthday, sweetheart! You surely have your own way of taking advantage of your charm. You summon me with your purr. Happy birthday to the cutest kitty in town. To be honest, I was quite annoyed when you took over my bed and my sofa, but when you took my heart as well, all I felt was happiness. Happy birthday to my fur ball! As days passed by, I have finally accepted the harsh truth that I am your servant rather than your master. I just can’t say no to your purrs! Happy birthday, kitty! When I first heard you say meow and purr, my heart was filled with so much joy, that is why I didn’t have the choice but to adopt you. I want you to know that it is the best decision of my life. Happy birthday to my cute little cat! To my dearest baby, my cute adorable cat, know that with your every purr, my stress goes all away. You even heal all the pain from my heartbreaks. I love you so much and happy birthday! Sometimes when it seems like all my patience are gone because of your playfulness and tearing my books and pillows out, I just look at you and think I am still lucky to have the most stunning kitty in the world. Happy birthday, sweetie! Even though you are too demanding when you are hungry and wants food and attention, I still love you and care for you the most. That is because one look at your luscious fur takes all my breath away. I love you kitty cat. Happy birthday! To the only one in this world who can stop my tears from falling, my lovely cat, happy birthday to you. I am so fortunate to have you in my life. Everyone in this neighborhood are now planning to get a pet cat after seeing you. You are just irresistible everyone was envious. Happy birthday, beautiful! To the real queen of this house, my little master, my cat, happy birthday to you! Today your highness, you will be served anything that you wanted. I only have one big question in mind right now, how can I still love you so much despite the fact that you do not pay attention to anything that I say and you do not even give me any affection. I guess, you are just too cute to ignore. Happy birthday, kitty! Happy birthday fur ball! So how do you want me to call you today? Master, boss, princess, or queen? Whatever it is, your wish is my command! You are truly lucky to spend nine lives with just eating and sleeping all the time. Happy birthday, fur ball! Whenever you do those cute head rubs I feel like I am on outer space for it is an amazing experience each time. I will never get tired of it. Happy birthday to the cutest, my fur ball! On your birthday, we are hoping for more adorable purrs every year. Happy birthday to our lovely baby, kitty! We may not speak the same language and I do not understand your gestures as well most of the times, but what I am sure is that you are my lucky charm. I have been receiving tons of blessings since you came into my life. Happy birthday to my angel, my sweet cat! I haven’t seen any other cat in this planet who is as stunning as you. Your fur is the softest and your eyes, the roundest. Happy birthday to my furry little angel! We do not need to speak the same words to tell one another how much we love each other. You just need to purr beside me or do your cute little head rubs against my legs. May you have the happiest birthday today, fur princess. You may just be a tiny cat, but you have taught me life lessons that no other human can like being so independent. On your birthday, I wish that each of your nine lives will be longer. Happy birthday, love! Since it is your birthday today, you are free to do anything you want including scratching and damaging my furniture. Be a little bit gentle though! Happy birthday, sweetie! When you got sick, I do not know what to do. I felt like a mother who worries about her own child. I hope that this birthday brings you better health. I love you my cute little cat. Happy birthday! I love almost everything about you, but my favorite one is your soft black and white fur that I always wanted to touch. Happy birthday, furry angel. You have the softest and whitest fur I have touched and the roundest eyes I have seen. You are simply a beautiful creature. Happy birthday, sweet cat! Who needs a blanket when you have a healthy and playful cat who has the softest fur in the world? I always thank God that you are my pet. Happy birthday, love!